Drs. 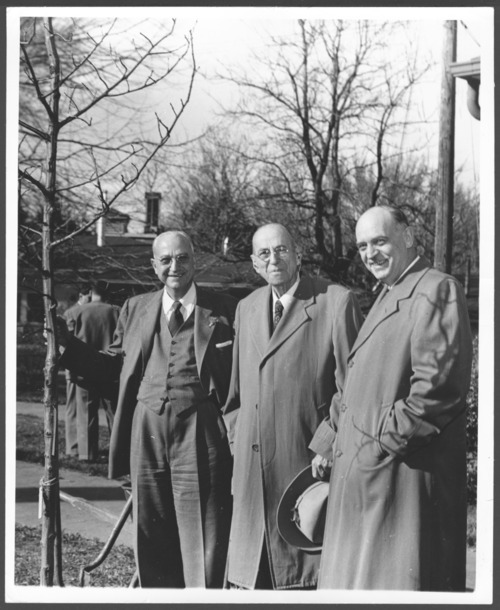 Karl, C. F. and Will posed outside on Arbor Day, April 3, 1953. Dr. C.F. Menninger and his sons, Dr. Karl and Dr. Will, founded the Menninger Clinic for mental-health treatment, education, research, and prevention in Topeka. Dr. Bob, son of Dr. Karl, and Dr. Roy and Dr. Walt, sons of Dr. Will, continued in the leadership of the Clinic. Arbor Day was always celebrated at the Menninger Clinic because of the deep interest in the environment.